At Friendswood Dental Group, Dr. Sierra and his staff are fully dedicated to the dental and oral health of your family. But the truth of the matter is we need help from someone special—you. We need you to schedule your regular dental cleanings and checkups. The American Dental Association recommends seeing the dentist at least every six months; some people who are more susceptible to tooth decay or who have had periodontal disease may require more frequent visits. At your regularly scheduled visits to our office, the Friendswood dentists and their team of dental hygienists and dental assistants will look for dental and oral health problems that may not yet be obvious. For instance, gingivitis—the early stage of gum disease—may come on subtly. However, our skilled hygienists know how to spot the early warning signs of periodontal disease, so we can treat this oral and general health threat early in order to help you avoid damaging consequences. When you come to Friendswood Dental Group in Friendswood, TX for your dental checkup, we’ll begin by asking you some questions about your overall health, which can be directly linked to the condition of your teeth and gums. We’ll also want to know if you’ve started any new medications and we’ll check your blood pressure. Then, the hygienists will thoroughly clean and polish your teeth. We trust that you brush your teeth twice every day and floss at least once a day. Nevertheless, reaching every tooth surface can be a challenge. Therefore, a professional dental cleaning is very important, not only for the health of your smile but for the appearance, too. With a special rotary brush and handheld tools, we can remove surface stains that may be marring your otherwise white smile. In addition, the hygienist will floss between your teeth to remove any plaque buildup and we’ll remove bits of tartar (hardened plaque) that might otherwise quickly lead to gum disease. 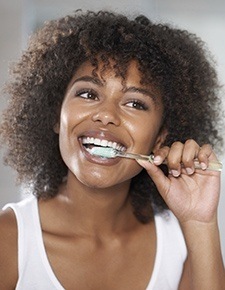 In addition to cleaning your teeth, we’ll also carefully examine your teeth, gums and entire oral cavity. In addition to annual digital x-rays, we’ll visually examine each tooth to find soft spots of enamel that may indicate the beginning of a cavity. The hygienist will also chart the depth of pockets between your teeth and gums; a depth of more than four millimeters can signal the beginning of gum disease. Finally, your Friendswood dentist will use the VELscope oral cancer screening system to find any soft tissue with pre-cancerous or cancerous cells. 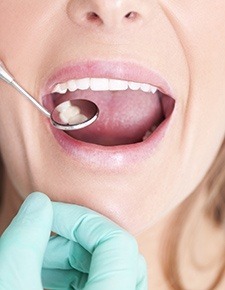 Oral cancer is a serious disease, but with early detection it is often treatable and curable. To schedule your next dental checkup, contact Friendswood Dental Group today.